My children certainly consumed their share of frozen waffles. They were fast and easy to pop in the toaster and onto a paper plates as we were headed out the door to Sunshine Day Care or Britton SACC. On the weekends however, we made pancakes from scratch. They were a staple for sleepovers for sure, but very often we made them just for us. The cinnamon and vanilla (the vanilla is my only addition to the recipe) made them tasty enough to eat without being drowned in syrup and even back in the 1990’s I thought whole wheat was a plus. OK sometimes we dropped on a few mini chocolate chips for fun! The source for this recipe is Pancakes And Waffles by Elizabeth Alston. I don’t recall where I found this little gem of a cookbook but it has a time honored spot in my collection and it now falls open to page 14 where this stained and spattered recipe for pancakes resides. In the margins are written quantities for doubling (almost always) and tripling (weekend sleep-overs). There is also a spot in the instructions where my daughter underlined the directions for combining the wet ingredients and adding them to the dries. It is almost certainly one of the first recipes that she learned to make on her own. As testament to this, there is a certain yellow bowl that to this day sports a pour spout from a too close encounter with the electric griddle. For years after the bowl served as a strainer when pouring off water from shocked green beans etc. It now has an honored spot in the sauna. That griddle is also an important contribution to this recipe’s place as a sleep over institution. It was a wedding gift from my sister-in law and her husband. The intended use being, the making of lefse. If you are not of Scandinavian heritage (as I certainly was not), this is a delightful tortilla like flat bread made primarily of potatoes and flour. It is a critical component of any true Norwegian or Finnish Christmas feast-especially for those of us who only tolerate the lutefisk. If you don’t know about lutefisk, consider yourself lucky and if you do you will likely understand what I’m talking about. At some point I’ll share this time honored delicacy with you (the lefse, not the lutefisk) but it will wait until I have the helpful hands of my daughter, as it is a project. In any case I remain grateful to my sister-in-law for introducing me to this awesome piece of cookware. On this, you can make pancakes fast enough to keep even the hungriest of sleep over crowds happy. 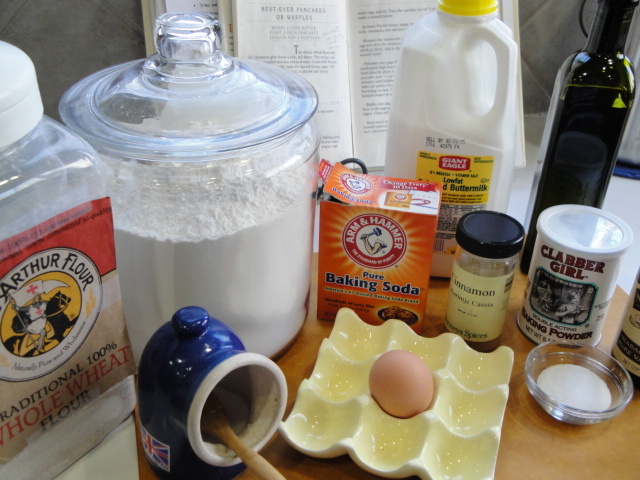 Ingredients : Flour (half whole wheat and half all purpose), sugar, baking powder and soda, cinnamon,salt, buttermilk, egg, vanilla & oil. Start by combining the dries-it’s important to mix well. No one wants to bite into a lump of baking powder or soda. The cinnamon not only adds great flavor but it helps you see that you’ve done a good job of mixing. Now do the same thing with the wet ingredients. If you don’t keep buttermilk in your refrigerator you can substitute with a combo of plain yogurt and water, if you don’t have yogurt you can use milk plus vinegar or lemon juice. If you don’t have any of these you’ll need to go to a Waffle House. Sometimes on the eve of a big sleep over party I would do the first two steps ahead and refrigerate the wet mixture. Then it was just a matter of mixing the two together and heating up the griddle. The batter should be smooth but not over beaten. If it seems too thick, thin it with a bit more buttermilk or milk. How thick is too thick?? 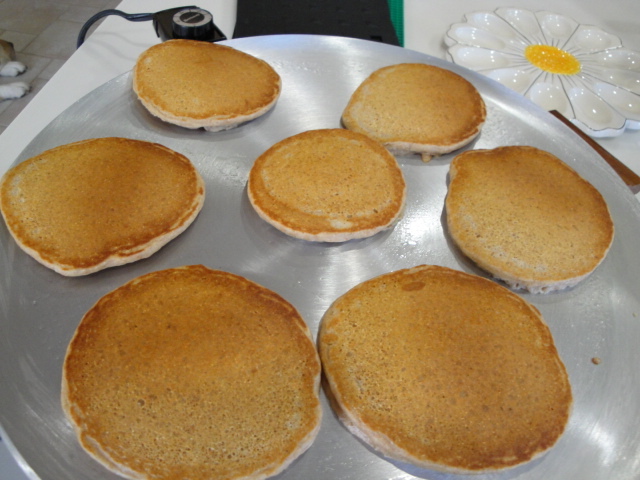 This depends on how you like your pancakes, so cook one and adjust-I’ve never had the batter be too thin as written, but have often thinned it just a bit. I usually cook one pancake to make sure the temperature of the griddle is perfect and to munch on while I cook the rest. They are ready to flip when you see these little bubbles forming on the surface and the bottom is nice and brown. 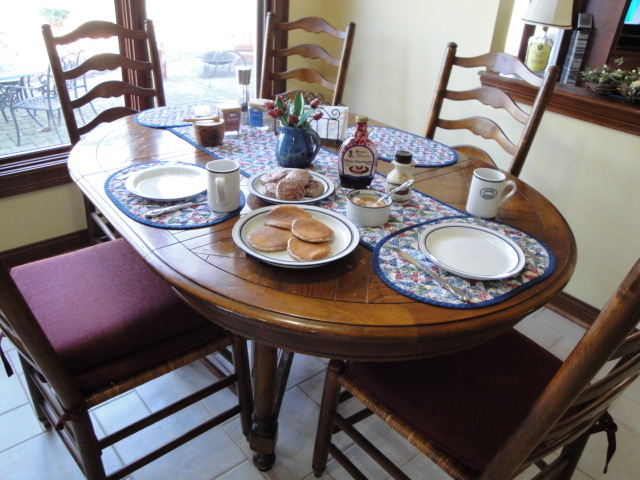 Resist the urge to smash or flatten the pancakes while you are waiting for them to cook on the second side. If you must do something with that spatula in your hand, turn the sausage that should be cooking to go along with your tasty cakes. 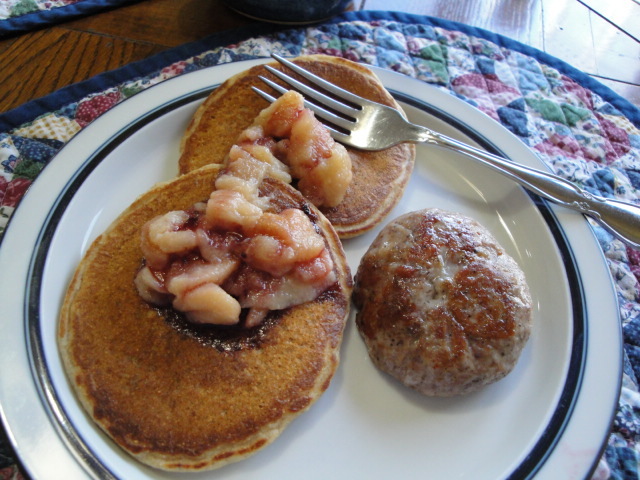 My personal favorite toppings are sautéed apples and a drizzle of berry syrup with a side of sausage but real maple syrup and bacon have a following at my table as well. Oh and don’t forget the mug of hot Nestlé Quik. Happy Breakfast-or Lunch or Dinner! 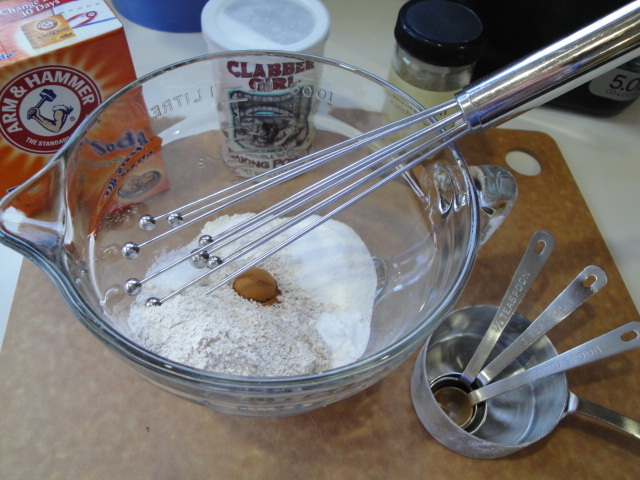 Combine flours, sugar, baking powder and salt in a large bowl and stir or whisk to mix well. 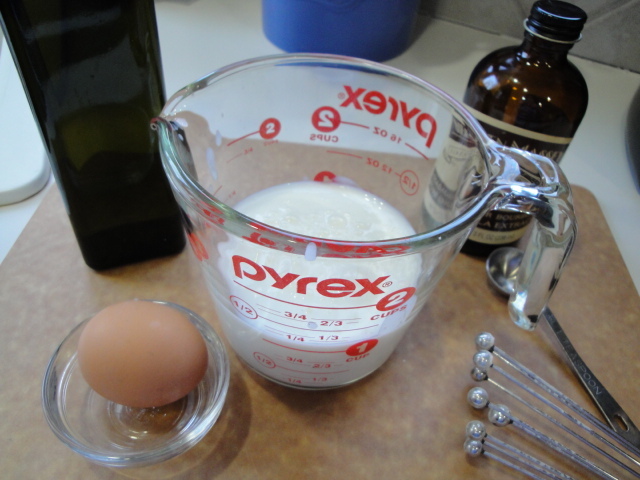 Measure the buttermilk in a 2-cup or larger glass measuring cup. Add the egg, vanilla and oil. Beat with a fork or whisk to blend. 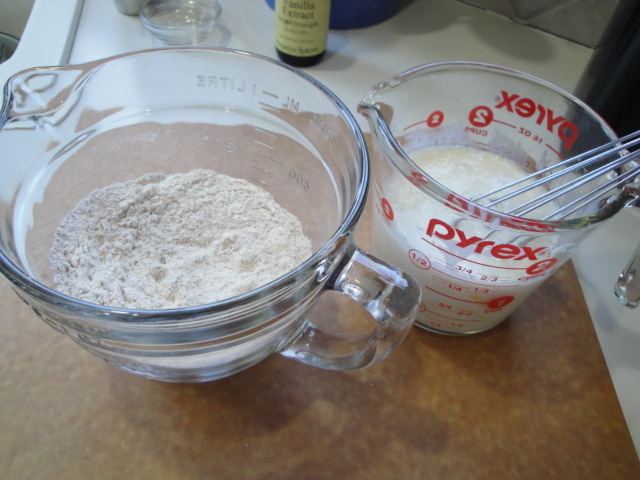 Add the milk mixture to the flour mixture and stir to form a smooth batter. If the batter seems too thick add a splash more buttermilk or milk. Heat a griddle or large skillet over moderately high heat until it feels hot when you hold your hand directly above it. Lightly grease using a silicone brush or a folded paper towel. 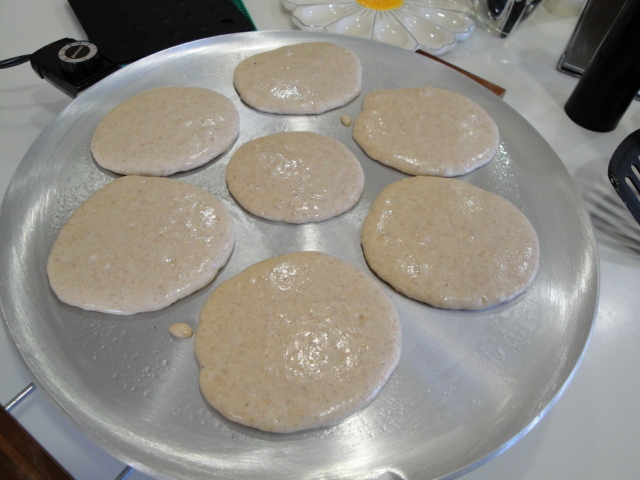 For each pancake ladle approximately ¼ cup batter onto the griddle. 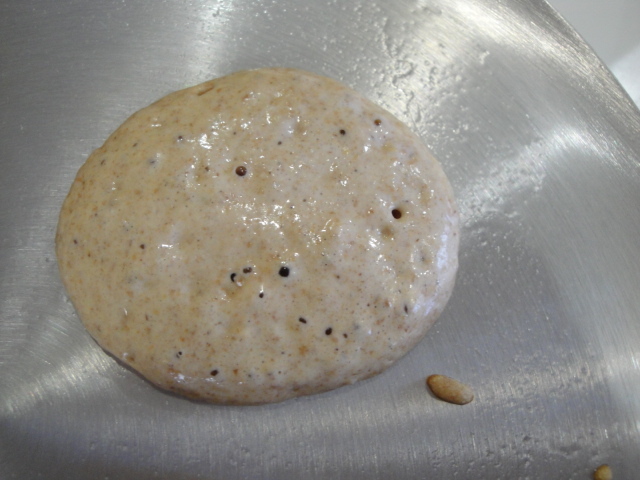 Cook until bubbles appear on the surface and the undersides are golden brown. If your griddle is at the right temperature this will take from 3-5 minutes. If the pancakes are browning too fast, turn down the heat!!! Turn the pancakes over and cook 1 to 2 minutes longer to brown on the second side. Resist the urge to flatten the pancakes with your spatula. If you are cooking these to order over a span of time, the batter will likely thicken-just add a splash of milk to get it back to the correct consistency. If you’re cooking some ahead of time to try and keep up with a crowd, keep them warm in a 200°F oven. Place them on an oven safe plate and cover loosely with foil to keep them moist. * if you don’t have either buttermilk or yogurt the next best substitute can be made by putting 1 Tbs. vinegar or lemon juice into a liquid measuring cup and filling to the one cup mark with milk. Stir and let sit until the milk thickens and is acidified.